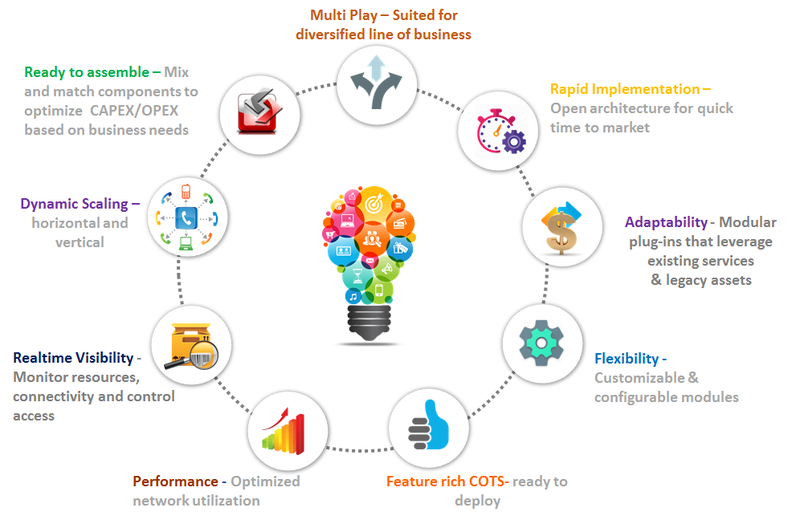 Daemon Telecom Suite is an agile, multi-play converged BSS solution with CRM, Mediation, Billing and Rating functions as its core and architected for the connected world to deliver sophisticated and personalized features that support complex business models and provide superior customer service experiences in the new Digital Economy. Daemon Telecom Suite offers an optimal choice to transform existing Legacy Billing, OSS and BSS and partner management solutions into next generation converged BSS OSS and CRM solutions and is targeted for the telecommunications operators, corporate IT service providers, Financial transaction providers, SAAS and infrastructure companies and small businesses with legacy CRM systems and Billing systems. 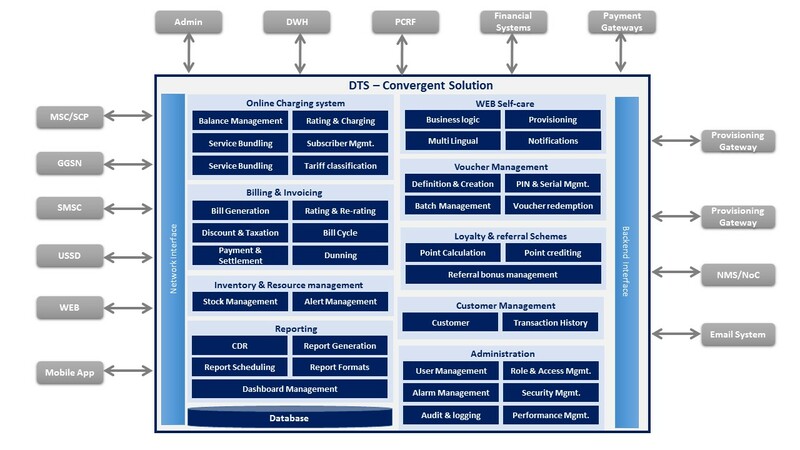 DTS allows them to immediately benefit from their competitive advantages while significantly reducing time to market for new services and at the same time lowering the total cost of ownership by leveraging existing assets and legacy solutions. It offers an optimal choice to transform existing billing systems and partner revenue management solutions into next generation converged OSS BSS Solutions. Convergent Platform to provide Unified billing service with complete order to invoice – configurable bill cycles, carry-forwards and tailored bill formats for (dis) aggregated needs. Fully automated rate management, to create the myriad of rate plans through a simple UI. Quick and easy creation of contextual offers and bundled services with a Dynamic product Catalogue Management to seize market opportunities. Flexible Workflow Engine to automate Business process support and Quality Control gates. 360° view of the Customer with all the required information in a single view at a micro and macro levels with Out-of-the-box CRM & CEM tools. Payment and Account Receivables management accomplished by integrating with gateways and External financial systems and Banks over secured interfaces with pre-built adaptors. Ability to define personalized promotion & discounting schemes to reduce churn. Self-care to enable customer self-service management (inquiry, subscription, activation, deactivations, etc.) through an efficient Web interface. Centralized Inventory Management for different resource types (SIM/IMSI/MSISDN/Vouchers/Bundles) with simple logistic and operations support. Daemon Telecom Suite supports TM Forum’s e-TOM standards. Comprehensive Business Intelligence Module with an ability to add on Daemon’s patented credit-and-risk scoring engine to mine high margin customers and prevent churn while analyzing business strengths and market opportunities. Centralized Administrator Console offering carrier-grade features for Operations & Management. Intuitive & User-friendly Dashboards and Reports that can be customized to user need. Highly Scalable and Redundant carrier-grade system that delivers consistent services. Provides an easy-to-use OSS BSS platform for operations staff and partners that promote transparency, security, actionable information and efficient task execution. Our OSS BSS solutions implement the best practices such as the eTOM framework as discussed above. DTS’ architecture clearly demonstrates the convergent solutions it can provide to both operators and their customers. The operational systems and the OSS BSS platforms work in accordance with your business revenue leaks, debts and interconnected billings to future-proof your business.